GIS was introduced in 2007 in Rwandan secondary schools. 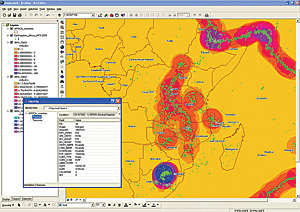 Use of maps and graphics helps students become familiar with computers. GIS fosters spatial reasoning, and students gain a comprehensive understanding of their environment. Situated two degrees south latitude alongside the African rift valley, Rwanda appears a little squeezed between the Democratic Republic of Congo and Tanzania. The northern and southern neighbors, Uganda and Burundi, provide the main access to this poor, landlocked country with one of the highest population densities in Africa. Due to its central location, Rwanda unites English and French language regions and plays a linking role for neighboring countries. However, it is not only for the multilingual character but also for the mountains and water resources that Rwanda sometimes is called the "Switzerland of Africa." Those green hills give home to almost 10 million people surrounded by banana trees and fields of potatoes, manioc, coffee, tea, and other commodities. Natural forests and wildlife are pushed away into the three national parks, including the Volcanoes National Park where the last mountain gorillas struggle for survival. Students visualize, explore, and investigate key societal and environmental problems using GIS. Through analysis of earthquake densities, they learn about plate tectonics in Africa and around the globe. The genocide of 1994 left thousands of scars in the country. Since those terrible days, Rwanda has been working hard to rebuild all aspects of society, with education being a fundamental one. In the National Vision 2020, Rwanda states its commitment for education for everyone and targets information and communication technology (ICT) as the primary national goal. Expectations are high and developments promising toward the transfer from an agriculture-based to an IT-literate society. Matching Rwanda's Vision 2020, GIS and remote- sensing technologies are gaining a foothold in this postconflict but fast-recovering country. As part of this vision, the Centre for Geographic Information Systems and Remote Sensing of the National University of Rwanda (CGIS-NUR) has been created to support the development of a GIS-based education and research program at the university. As part of the mission of the university to serve the community, the center is also seen as a consulting organ for GIS applications in governmental and private industry issues. In 2005, Michael Sittard of Esri Geoinformatik GmbH, Esri's distributor in Germany, recognized the key role of the center to promote the use of GIS at all levels of the society and how it is working to transform Rwanda not only into an IT society but also into a spatially IT-literate one. The CGIS-NUR won a Special Achievement in GIS award at the Esri International User Conference in 2006, Additionally, Esri subsequently provided GIS software to every secondary school. In Rwanda, only a handful of secondary schools have 20 or more computers. Most are older machines that have been refurbished and donated. They have only little working memory, and if Internet is available, it is usually too slow for efficient use in a lesson of 50 minutes. Some schools don't have electricity at all or have frequent power outages. The Ministry of Education is making a strong effort to improve this situation. In addition to the computer shortage, there are few teachers who have had any exposure to information technology. In 2003, the Ministry of Education set up an ICT training program for secondary school teachers. About 1,000 teachers have completed this training and learned how to write letters and e-mail, calculate with tables, and prepare presentations, plus they have gathered basic knowledge in handling an Access database. Meanwhile, only a few schools provide lessons in ICT, because the curriculum is not yet published and lessons are not budgeted. Seeing the schools' situation improving little by little, CGIS-NUR, together with the Ministry of Education, initiated the introduction of GIS last year at Rwandan secondary schools. The project aims at capacity building for Rwanda's youth. The use of maps and graphics helps students become familiar with computers and, at the same time, fosters spatial reasoning so they gain a more comprehensive understanding of their environment. 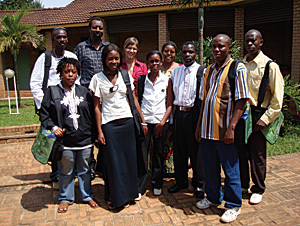 After completion of the GIS training for secondary school teachers in 2007, teachers such as these pictured developed ways of applying GIS in their classrooms. In a first phase of the project, 10 schools and 30 teachers were trained and prepared for teaching with GIS tools. The schools and teachers were selected according to different criteria, such as number of working computers, experience in teaching IT, and stable electricity. The public, private, and religious schools with French and/or English instruction are distributed all over the country and serve as training centers for subsequent schools in their neighborhoods. They are currently teaching GIS to about 500 students and evaluating GIS as a didactic medium to explore, investigate, and illustrate common curriculum contents. Because there is no official curriculum, the teachers offer GIS lessons on a voluntary basis and rely on a draft GIS textbook designed for Rwandan students/teachers. Basic GIS methods and tools (ArcView) are applied to environmental, societal, and economic problems, thus imposing a multidisciplinary use of GIS. Through a snowball dispersion model, where schools train following schools and teachers support teachers, the project plans a yearly expansion by a factor of four. Started in 2007, it is expected to reach all 600 secondary schools of Rwanda by 2011. To secure the efforts being taken, a first step towards institutionalization has been launched with the National Curriculum Development Center this year. Based on the evaluation of the textbook and the experiences at the pilot schools, GIS curricula are currently being developed for secondary schools. The curricula will see GIS as a new teaching method on one hand and as its own subject or chapter on the other hand. The approval of the GIS curricula and respective national standards is expected in 2009. Introducing GIS to Rwandan secondary schools adopts Rwanda's general endeavor for becoming an IT center of excellence. This project is not only building capacity but is also creating future job fields for Rwanda's youth. Students and teachers gain computer skills and enlarge their knowledge in the field of modern computer technologies. The National University of Rwanda benefits from the rising level of awareness when students enter higher education. Real support in the production of maps and data will relieve CGIS-NUR and allow for focusing more on research and studying program development. Counting on the fast-developing ICT sector in Rwanda, the idea is to deploy modern GIS using ArcGIS Server technologies and ArcGIS Desktop ArcView. Students will be able to overlay national topographical data with locally collected data and to jointly exchange their data, results, and exercises to open up broader perspectives. This must not be limited to Rwandan schools; in fact, it is a larger goal to connect Rwandan students to students all over the world, synchronizing their expertise. The project hopes to contribute to the creation of responsible citizens that care about the future of local communities backing the society. For more information, contact Martina Forster, project coordinator, Centre for Geographic Information Systems and Remote Sensing of the National University of Rwanda (tel. : 250-0840-3837, e-mail: martina.forster@cgisnur.org).